This sounds like a really fun idea that takes the hassle out of vacationing. Surely I’m not the only one who dreads the tasks of digging through website after website getting quotes from airlines, finding and pricing hotels and searching out the local activities. The last time I planned a vacation I spent nearly all of one day just hunting for the best price on accommodations. You know the drill. Find a place, looks great, good price, check another place, looks decent, better price. Then read the reviews, bad staff. Back to the first place, doesn’t have a pool. And so on and so on. Finally I nervously place a reservation. Next comes the airfare. First I compare prices from one airline to the next. Once I decide on one I check the destination, the time, the seating, over and over for fear I’m about to make a mistake. And even then, I’m practically petrified to pull the trigger. I do realize that services like Travelocity, Kayak and Expedia can coordinate and do some of the leg work for you, but I find it hard to place my trust in them to get me the best prices and best locations. And even the fun part, surveying the available excursions and local travel guides can really be a time waster. Not to mention that I’ve gotten my heart set on something that wasn’t even available when I showed up. So I guess this new service from Pack Up + Go could actually be pretty useful. It kind of forces you to take your hands off and put your faith in them. Instead of hyper ventilating over every minor detail with a veracity that only a control-freak could love, you literally just spread your wings and fly. It seems like they give you a survey so you can specify locations or climates that you would rather avoid. And the idea of your destination being a secret sort of adds to the fun and anticipation. 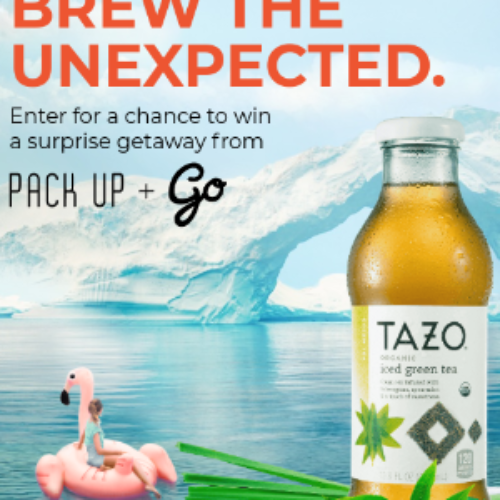 Well I hope one of my subscribers or fans wins this sweepstakes for a truly unique and innovative vacation option and can let us all know what they thought of the Pack Up + Go experience. Let me know in the comments section below when the last time was that you took a vacation, and if like me, you nearly gave yourself an panic attack before even getting out the door. It’s been a long time since my last vacation, real vacation and that would be President’s Weekend 2015, we visited 4 Presidents homes and had a grand time….haven’t been away since. Thanks for letting me know! It’s fixed, you can click “TAZO” in the first paragraph of the article to access the page to sign up.